The Baron purchased Barbara from her ne’er-do-well father when she was but a child; why he did this and even the names of Barbara’s parents are a mystery to her. He treated Barbara well, in a distant and kindly fashion; he gave her an education in letters and swordplay (in both of which she excelled). She in turn served him faithfully. She expected to be freed when he died; his decision to leave her to Margerit is a bitter disappointment. Suddenly elevated from respectable bourgeoise to wealthy heiress, Margerit must adapt to new, often unpleasant realities. She once would have had some difficulty in finding a suitable husband. Now her fortune makes her a treasure worth possessing—not a good thing in a society that tolerates kidnapping and forced marriage1. She also faces danger from the Baron’s loathsome nephew Estefen. He had confidently expected to inherit the baron’s fortune as well as his title, and had borrowed heavily against the expected bequest. Now he finds himself with title and lands but no fortune to support them or to repay his vast debts. He has been wronged, as he sees it, and seeks revenge. The Baron is beyond his reach, but Margerit is not. I generally don’t care for thrilling tales of the grasping upper classes unless those stories involve tumbrels and guillotines. Jones manages to sidestep my distaste by focusing on characters whose rank confers very little in the way of power: women in a sexist Ruritania2 that sees women as trading pieces and broodmares, that tolerates eccentricities like a desire for education or a talent for magic as long as they don’t interfere with the marriage business. Jones also goes out of her way to illustrate how self-serving and despicable many of the aristocrats are; no Tolkienesque forelock -tugging here. All the same, I could not help wondering how this story would have morphed if it had been set amongst the lower classes. I suspect it would have ended less happily. I joke, of course. There are no interesting stories to be told about peasants. Sleep eluded her at first as her aunt’s words echoed in her mind. Of course she knew the ways of men and women. She might have been sheltered but you couldn’t read widely in the classics and remain ignorant. That was a different matter than thinking what it might mean to her personally. How would a woman kiss when playing a man’s part? Differently? She looked over at Barbara obliquely and imagined what it might be like to kiss her, to be kissed by her. It had never occurred to her to imagine kissing any of her prospective suitors. She’d simply accepted that it would happen in its own time. Margerit had danced with girls—one did, after all, at family parties when no thought for careful balance had been taken. It was different dancing with men who saw you as a potential wife. There was a possessiveness in their hands, an assumption of control in the way they guided you through the figures. What might it be like to dance with a woman who danced as a man? Who treated it not as a pastime but as the allegory for a further act? And how…? What…? In her mind, she offered her hand to Barbara and led her out onto the floor as the music began. As precautionary measures go, the aunt’s warning has to rank up there with abandoning the infant Oedipus. 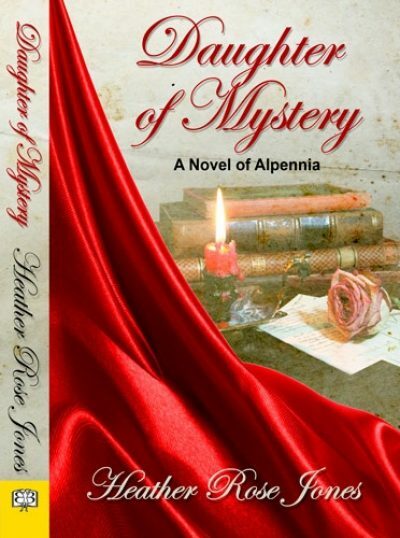 Daughter of Mystery was followed in 2016 by The Mystic Marriage, which I have not read. Both are available here. 1: I have no idea where exactly Alpennia is located. The geographic hints contradict each other. Alpennia seems to be close to France and Austria-Hungary, but feels no fear of the Turks, which would rule out the usual Balkan location for Ruritanias. I wonder if Alpennia will be neutral in the Great Wars? 2: Although there’s little done in Alpennia that was not done in nations like Britain or Canada within historical times.